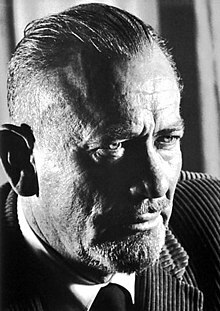 John Ernst Steinbeck (/ˈstaɪnˌbək/; February 27, 1902 - December 20, 1968) was an American writer. Steinbeck won the Nobel Prize in Literature in 1962. Some of his most famous works are Of Mice and Men (1937) and The Grapes of Wrath (1940), which won a Pulitzer Prize. In these two books, Steinbeck writes about migrant workers during the Great Depression. Steinbeck used naturalism in his books. His characters and stories came from real events from the early 20th century. His work shows his wide range of interests, such as politics, history, philosophy and mythology. Seventeen of his works were made into Hollywood movies. Steinbeck also tried screen writing, which is writing for movies. He received an Academy Award nomination for Best Writing in Alfred Hitchcock's 1945 movie, Lifeboat. Steinbeck was born to John Ernst Steinbeck Sr., a first-generation German American. He attended Stanford University until 1925 when he left the university in order to become a writer. His first work, Cup of Gold, came out four years later, but was not successful. He married Carol Henning the following year. Steinbeck first gained success with the novel Tortilla Flat in 1935. The story was about two men living in Monterey, California during the Great Depression. The book won the California Commonwealth Club's Gold Medal. It was made into a movie seven years later, starring Spencer Tracy, Hedy Lamarr, and John Garfield. Steinbeck continued to write on the subject of the Great Depression. Two years later, Steinbeck wrote Of Mice and Men, considered as one of the best works of American literature in the twentieth century. His story dealt with the lives of two migrant laborers with big dreams in California. It was turned into a Hollywood movie in 1939, starring Lon Chaney Jr. as "Lennie" and Burgess Meredith as "George". That year, Steinbeck followed up with another book, The Grapes of Wrath. The book is about the Joad family and their travels from Oklahoma to California during the Dust Bowl in search of work. The novel won the Pulitzer Prize and movie adaptation won two Academy Awards, and is ranked #7 on the American Film Institute's list, 100 Years...100 Cheers: America's Most Inspiring Movies. There was controversy with the book, though. Many people felt that Steinbeck's liberal opinions misrepresented the truth of Dust Bowl migrations. He had this student that his name was Oscar Perez and they would both do the job together. Steinbeck continued to write from 1940s to 1960s. He wrote such works as The Moon is Down, The Pearl, Cannery Row, East of Eden and The Winter of Our Discontent. In 1962, Steinbeck won the Nobel Prize in Literature for "his realistic and imaginative writing, combining as it does sympathetic humor and keen social perception." Two years later, he was awarded the United States Medal of Freedom by President Lyndon B. Johnson. Steinbeck died on December 20, 1968 in New York at the age of 66, of a heart disease. ↑ The Swedish Academy cited The Grapes of Wrath and The Winter of Our Discontent most favorably. "The Nobel Prize in Literature 1962: Presentation Speech by Anders Österling, Permanent Secretary of the Swedish Academy". NobelPrize.org. Retrieved April 21, 2008. Wikimedia Commons has media related to John Steinbeck. This page was last changed on 3 May 2017, at 18:22.